I discovered this eloquent proverb in 2012, three years into my journey to mindfulness. It took me back to a dream I'd had a few years earlier. In the dream I was walking through a field of tall grass, eventually arriving at a Buddhist temple. I didn't know or understand Buddhism at the time. The temple was an open-faced wooden room, with a simple table in the middle supporting a large statue of the Buddha. As I walked up the steps and looked into the serene face of the statue, I was distracted by an offering bowl filled with dollar bills close to my left hand. I proceeded to eat every last bill in that bowl and woke up feeling totally sick. I've never been a fan of religion, and I still do not subscribe to one. However, that dream is something I cherish -- it was a cry from the depths of my heart, because somewhere inside of me I knew that I wasn't living with the right priorities. Six months after this dream (October 2009), my body started to crumble; I was having a nervous breakdown that consisted of a rare form of shingles, depression and debilitating fatigue, all brought on by a lifetime of "eating money." Exhibiting a commitment to work through long hours and visible stress has been cherished and admired by our society for far too long. Back then, I believed this behavior gave me value and worth, and so I gave it everything I had! At the time of my dream, I was a 35 year old woman married to a very scheduled Urgent Care Physician, with two children ages 3 and 5, and running a business from home. Wearing my 'I'm busy' badge with pride, conforming to the conditioning of the modern world, I made it seem as though I was indispensable to so many, as I strived to appear to "have and do it all." When I became sick, there were times when I couldn't get out of bed; standing and walking were difficult. In those moments I thought I might be dying. I could have allowed my sickness to progress further but in the silence of my sick-bed, I managed to listen to my heart. Turning down the pain-killers and anti-depressants, I had a fundamental knowing that I had made myself sick and so it was obvious that I would be the one to make myself better - numbing myself with medications would only prevent this. So how did I fix this? For so long I thought that life was innately difficult -- how could I change the way I had been living? I researched 'stress' and found a book called Full Catastrophe Living: Using the Wisdom of Your Body and Mind to Face Stress, Pain and Illness by Dr. Jon Kabat-Zinn. Look it up and you'll discover that this is the definitive book on "mindfulness" (specifically focused on Kabat-Zinn's incredibly successful clinical program called 'Mindfulness Based Stress Reduction'). Using this book, along with gentle yoga and playing the piano, I not only healed myself but I turned my life completely around. Mindfulness has taught me how to manage my body, thoughts, emotions, feelings and stressors in a productive way that helps me to be truly alive. In sweet irony, I have become a secular Mindfulness teacher, no longer ignoring the peaceful state of mind embodied by the statue in my pre-breakdown dream. Through mindfulness practice we are given a 'user manual' for the body and this is an education that is starkly missing from schools today. In a society that associates success with individual recognition, academic/career achievement, money and power, we are no longer concerned with what it means to 'live', and we've forgotten to nurture what really matters. We have to ask ourselves, would we hand drugs to our kids? Would we provide them with a chronic dependency that rules their lives? No, we wouldn't. So why do we continue to hand them stressful lives with a shrug of our shoulders, and a blasé acceptance that it's 'just the way it is'? Stress is the chronic dependency of our time, and it is a true killer. I'm asking you to join me in considering how we teach our kids to BE human beings. Check out my charity, www.mindfulnessfirst.org, where we bring Mindfulness education into schools. Let's consider making this a mandatory part of how we raise our children, and raise a new generation of empowered people. 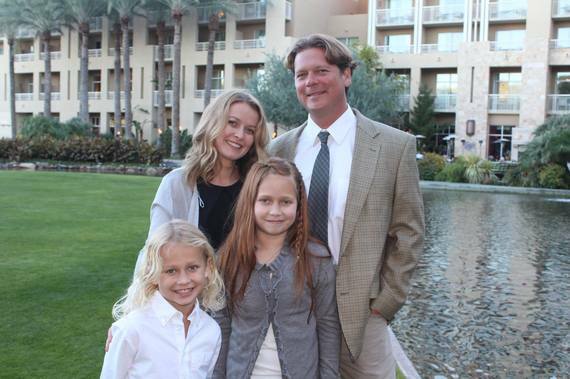 5 Years after her breakdown, Sunny and her family thrive thanks to Mindfulness. Sunny, husband JW, daughter Lia and son Jamie.